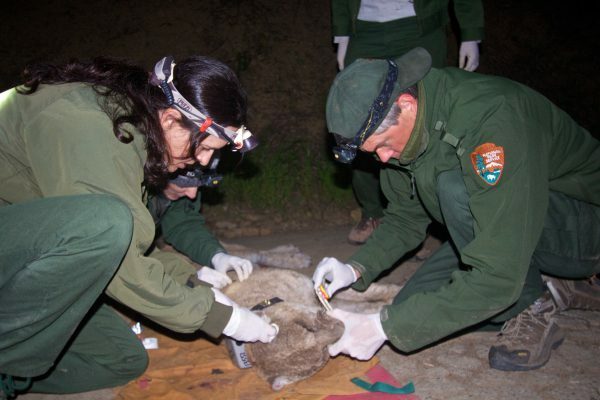 Forest Service personnel aid a mountain lion known as P-22, that lives in Griffith Park and was the subject of the documentary, “The Cat that Changed America.” P-22 got mange as a symptom of ingesting rat poison. The poison, placed next to an outside wall, was an anticoagulant, the strongest on the market, he said, and the same poison responsible for contaminating 105 of 111 mountain lions tracked in California over the past two years. Since 2012, three mountain lions have been found dead in the Santa Monica Mountains, and all had rodenticides in their livers, according to National Park Service reports. “I couldn’t come up with a better method to kill predators,” Schulman said during his after-dinner presentation to members of the Laguna Canyon Conservancy at the art festival’s restaurant. Schulman, an aerospace physicist who’s spent most of his adult life saving mountain lions in the Santa Monica Mountains, was being facetious. In more sober terms, rat poison is tampering with nature’s food web and, if that happens, the balance of our natural environment, which also supports people, could become unhinged, he affirmed. This could cause people to use more pesticides, poisoning themselves and their surroundings even more. Even now, 10,000 children are reported with exposure to rat or mice poisons at poison centers each year, he said. Mountain lions and bobcats, as well as raptors such as owls and hawks, are at the top of the local wild animal food chain and keep the balance of the animals they eat in check. If there are no more mountain lions, the number of deer could increase and vegetation would dwindle, causing the decline of, for instance, rabbits, butterflies and bees, completely upsetting the entire food web and, worst-case scenario, causing ecosystem collapse. Deer also cause 1.2 million car accidents annually, resulting in 200 deaths, thousands of injuries and billions in costs, according to University of Washington research. Schulman shows a photo of a majestic mountain lion striding atop a backyard fence in Newbury Park near Pt. Magu State Park. Nine months later, the same puma, P-34, is found dead from five different types of rat poison after eating dozens of mice. Predators are the natural answer to rodent abatement, Schulman pointed out. But the poisons people use to curtail pest populations are destroying the most effective antidote, he said. Contaminated predators often lose their ambulatory instincts and end up getting hit by cars or some other anomaly and dying that way, he added. The “bait box” of poison at Tivoli Too, a commonly used rodenticide by many cities and businesses, provides an entrance where the mouse, squirrel, rabbit or rat climbs in for a snack. But the box doesn’t trap them. They leave and immediately express the effects of their organs and glands shutting down. They live in an increasingly debilitating state for several days, Schulman explained, becoming the weakest link and easy pickings for, say, an owl. The owl then becomes sick from eating toxic food and easy prey for, say, a hawk or an eagle, which in turn becomes contaminated. Or the poisoned rabbit is eaten by a gray fox or a raccoon, which is picked off by a coyote or mountain lion, the largest wild cat in North America. And the chain of death repeats itself, “pumping poison out into the environment” Schulman said. There are other easier and safer ways to curtail rodents, he said. He calls it R.E.D.—Repel, Exclude, Deter—which translates to finding the cause and correcting it without using toxic means. Non-toxic products that repel rodents and use plant-based byproducts such as Castrol oil and mint oil, two things rodents avoid, are also available. Two were mentioned at the meeting—Critter Max and Rodent Stop. Some toxic rodenticides are off the shelves but still available and used by commercial pest control companies, Schulman said. Dale Schuck, Laguna Beach deputy director of public works and Irvine’s former facilities maintenance superintendent, said Laguna uses a triage approach. He calls it integrated pest management. “We don’t have a huge vector problem,” Schuck said. City trash cans and dumpsters are clean and emptied daily at parks and beaches. “We empty the trash 240,000 times a year here. Rats don’t congregate or breed then.” But the city does use poisoned bait boxes when deemed necessary, he said. 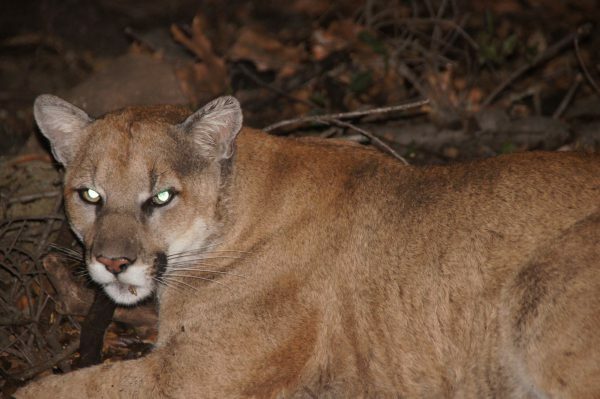 The surrounding Laguna Coast Wilderness Park hasn’t seen evidence of mountain lions since 2002 due to a web of freeways and toll roads, according to OC Parks Ranger Laura Cohen. That doesn’t mean it couldn’t happen, she added. OC Parks also hasn’t conducted an official study of rodenticides in wildlife, particularly in bobcats, which do inhabit the park, she said. Schuck said Laguna Beach uses first-generation anticoagulants, which are less lethal and slower-acting. City gardeners then check for carcasses and remove them to prevent the food-chain poison bomb, he said.Laguna Woods, another city adjacent to the 22,000-acre South Coast Wilderness preserve, now uses organic pesticides and prohibits the use of second-generation anticoagulants and glyphosates (Roundup) but can use first-generation rodenticides, according to April Baumgarten, public works. But first-generation anticoagulants are no better than the stronger second-generation variety, said Schulman. “First-generation still kills bobcats and mountain lions,” he said. 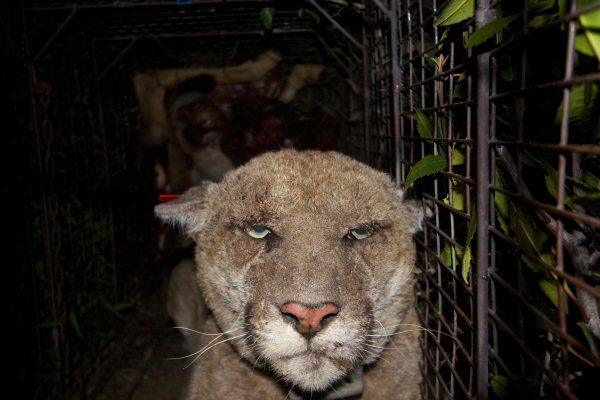 Read the article about Mountain Lions being poisoned and suffering from rat poison. REVOLUTIONARY NEW PRODUCT on the market called CONTRAPEST by a company called SENESTECH. Fertility control for rats. SAFE FOR RATS AND ALL OTHER ANIMALS. The quicker this information is spread the quicker animals will stop suffering from being poisoned!!! SPREAD THE WORD!! Thank you so much for this enlightening article. I see those boxes, filled with anti-coagulant pellets, everywhere. We have hawks and owls that patrol our neighborhood and I’m afraid they will fall victim to the effects of those pellets too. I’m hoping that people will gain a greater understanding and with that new wisdom, let nature provide the remedy.